I believe I first heard about The Art of Tea magazine through Teamail, the online chat group for tea lovers, of which I am a member. 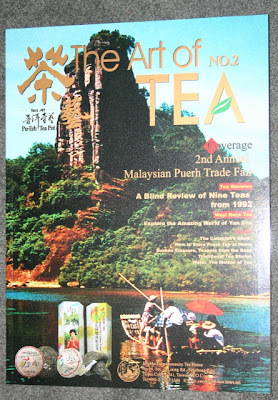 When I finally decided to spring for the $12.99 inaugural issue of this English-language magazine about Chinese teas, I hoped it would be worth it. The package arrived and I was quite impressed, since the nearly 200-page book was oversized, had a nice, thick cover, and was filled with gorgeous color photos. I think I'd like this magazine even if it were NOT in English! Only two issues have been published thus far, but I find lots to recommend them. In No. 1: Wonderful photo spreads of the tea leaves in individual tea gardens, experts discuss the Puerh tea market for Fall/Winter 2006, an article on the varieties of Formosa Oolong, how to choose a Yixing teapot. In No. 2: A discussion of buying teas online, a piece on Wuyi rock teas, an article on how "The Emperor's Red Cape Tea" was named, and an intriguing article on Yixing teapots rescued from the ocean floor. Both issues include many tea reviews, recipes for cooking with tea, and articles on Ikebana flower arranging. Well. I was SOOO good about doing posts before I went to the beach so I could simply hit "Publish" each day and have something new to share (I like blogs that are updated regularly), but then I slipped and missed a day. But I shall try to redeem myself now that I'm back home. What a lovely hour I spent there! The food was just delicious, and while the Tomato Dill Bisque was divine (I forgot to ask for the recipe! 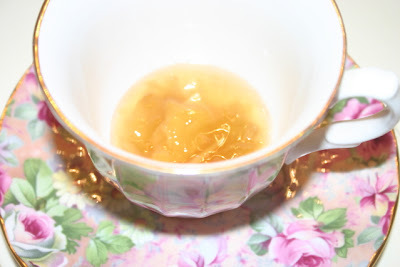 ), I was perhaps most impressed that it was served in a small, stemmed, pressed glass sherbet cup. What a great idea! I happen to have about a dozen or so of those stored out in the garage, but next time I give a small tea party I do think I want to serve soup that way. I also liked that my plate came with a small Bible verse perched on the edge. 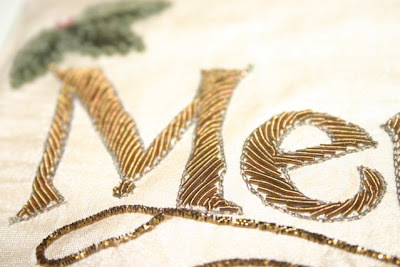 A tiny card read, "Like apples of gold in settings of silver is a word spoken in right circumstances. Prov. 25:11." 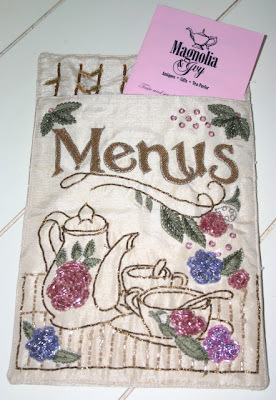 The young girls who served me were just charming, and I even had a happy find in the (enormously well-stocked) gift shop: this fabric tea room menu holder, above. It has that pretty Victorian style coiled metal thread embroidery (hope the close-up shows), and there's a magnet on back to attach it to the fridge. It's rare for me to find some tea doodad I've never seen before, so this was a particularly fun find. 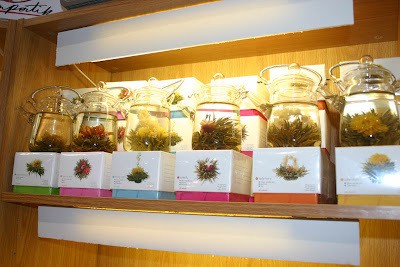 So if you're ever in the area, do give Magnolia and Ivy's Beach Tea a try! Dexter is a world traveler and longtime drinker of tea, and I love the imprint she has made upon her magazine. You know how some magazine editors do a good job with their book, but you just don't personally like THEM? Well, I predict you will like Dexter if you're not already a fan. She shares just enough of herself and makes sure tea is the star attraction, as it should be. That said, I do enjoy it when she shares some of the items in her personal collection of tea accoutrements and accessories. 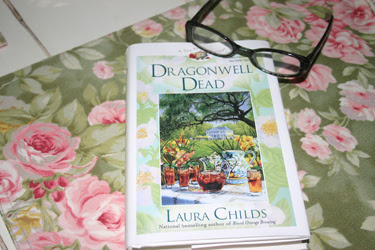 On more than one occasion, I've read one of her "Editor's Collection" pieces and headed to eBay looking for similar vintage tea tins or unusual tea towels like hers. 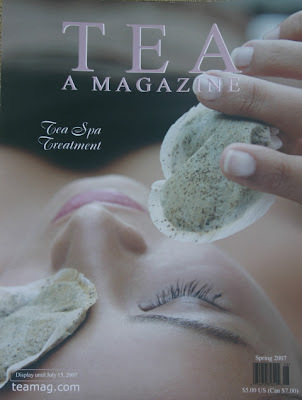 Tea A Magazine is the most intelligent of the tea magazines on the market today. You can count on Dexter and her writers to take you around the world (in the Spring 2007 issue we visit a Tea Spa in Malaysia), and the magazine also includes information on teawares (this one features Ida Lindsey China, on which I posted earlier) and book reviews that keep us up to date on the latest offerings for tea reading. If you're looking to educate yourself on all things tea and want just one magazine subscription, this one would be my recommendation. And at $17 for four quarterly issues, it's a good value, too. For more info, visit teamag.com. In the coming days, I thought it might be nice to blog about all the tea magazines currently available. 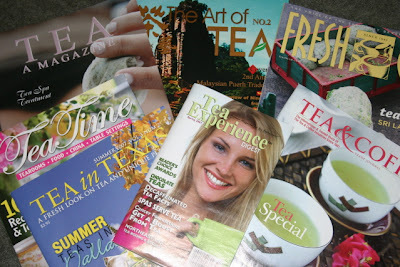 These seven are all the ones I know of: Tea A Magazine, Tea and Coffee Trade Journal, Fresh Cup, Tea Time, The Art of Tea, Tea in Texas and Tea Experience Digest. Coming tomorrow: Tea A Magazine. I don't recommend products I haven't personally tried, but ones I have tried and enjoyed, especially when I've received good customer service, I like to recommend. And so I'm happy to report I was very, very pleased with the products I recently received from Marmalady's in Portland, Oregon. At the Tea Expo I sampled (and went home with) a small jar of Marmalady's Rose Tea Jelly, which was perfectly delicious and such a treat. When I placed my order for the full-sized jar (just $4), I also ordered some of the Pear Lemon Marmalade with Organic Green Tea ($5), and it is just incredible. I had some on wheat toast for breakfast and loved the subtle green tea taste combined with the pears. Yum-o, as a certain cooking diva might say. I was also impressed that despite the modest size of my order, the shipment arrived very promptly, was well-packaged, included a hand-written thank-you note ... and I saw that Marmalady's subsidizes the cost of postage, since I paid several dollars less than it actually cost them to mail this. 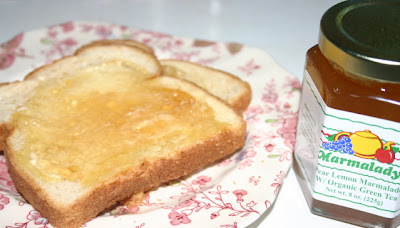 I think some of my friends may be getting Pear Marmalade in their Christmas packages this year! Visit marmaladys.com for more information. 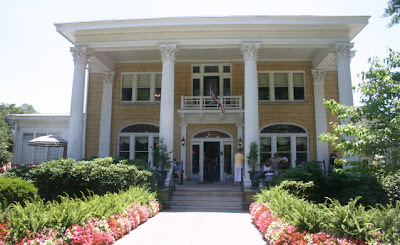 The Blue Willow Inn is a Southern country cooking sort of restaurant, not a tearoom, by the way, although their sweet tea was mighty good, and Beth and I wouldn't have dreamed of having anything else to wash down all those delicious fried green tomatoes we ate. As luck would have it, she and I were seated in the "Tea Room" upstairs at the inn, where tea accoutrements and artwork adorn the walls. How perfect! 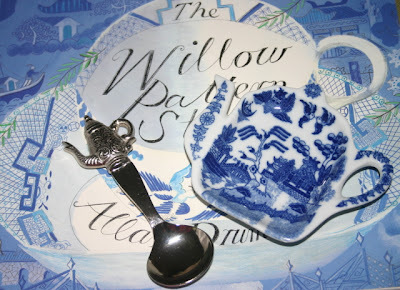 They also had a wonderful gift shop where I found a cute Blue Willow teabag holder and loose tea measuring spoon to add to my collection of souvenir tea goodies. This morning I happened to be reading the June 1995 issue of Victoria Magazine (I re-read these magazines in the month they originally debuted), and "Blue and White" is a theme, along with a nice story about Spode and Blue Willow. 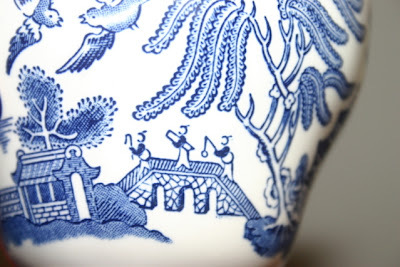 (Why am I suddenly hankering for that pretty blue and white living room with blue and white striped camelback sofas and white built-ins laden with Blue Willow china?) I'm very curious to see if the newly-revived Victoria, coming this fall, will revisit the annual themes that once made this magazine so popular. I certainly hope so! This morning I have the day off work and have time for a leisurely cup of tea, made all the more perfect by the particular kind of tea I get to have: my longed-for Emperor's Bride! 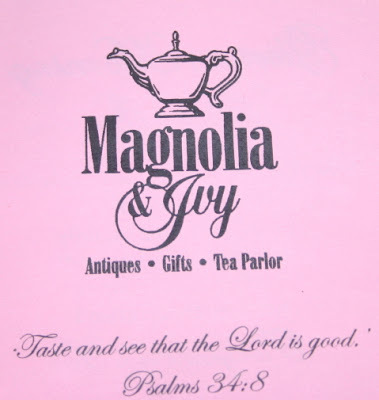 A friend in Savannah first introduced me to this tea, served at The Tea Room in Savannah, years ago, but since Savannah is several hours from my home, I don't get by there often enough to keep the tea pantry stocked. Last weekend, a friend's parents were in Savannah and she got them to stop by The Tea Room to pick up some Emperor's Bride for her, so guess who got in on the deal? Here's what the little card from The Tea Room says about this magnificent blend: "Emperor's Bride (Keisarin Morsian), A Tea Blend from Finland. To a base of Assam and Ceylon teas, bits of pineapple pieces, dried orange peel and thistle petals are added. This marvelous blend is further enhanced with essence of quince and elder." 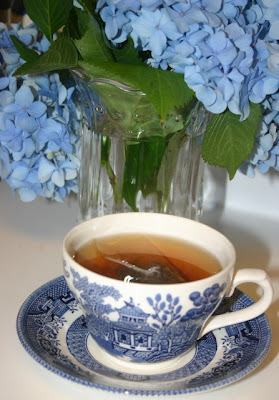 And because today I am going to visit a restaurant called the Blue Willow Inn, I am having my tea in a Blue Willow teacup and saucer. This set is very special to me because it was a gift from my dear friend Nichole several years ago. And it wasn't my birthday or anything, simply a "just because" kind of gift. Isn't that sweet! Here's a new product that's kind of gimmicky, but yet I like it! 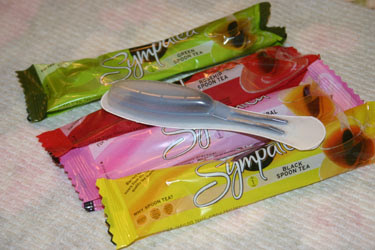 It's called Spoon Tea, and it's from a company called Sympatea based in Turkey. The tea is contained in the spoon-shaped plastic compartment, so you can let the tea steep and then use the entire thing to stir in any sweetener you may be adding. So far I've tried their Earl Grey, Mixed Herbal and Rosehips varieties and liked them all. The big selling point for these, I think, would have to be convenience. I wouldn't say these are the absolute best teas I've ever tried, but for a good afternoon tea break at the office they would be just fine. 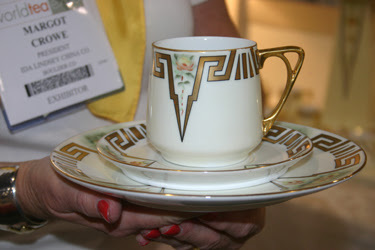 The Ida Lindsey China Company and its lovely pieces with bouquets of roses and 24-karat burnished-gold accents. I'd read about these teawares in a tea magazine, and "live" they are even more impressive. Margot Crowe, whom I found to be a very friendly, cheerful woman, is reproducing these designs from pieces that were originally painted by her grandmother Ida. This design is called Ida's Gift, designed by Ida in 1914, and I just love-love-love the Art Nouveau styling. It's a modern-day heirloom if I ever saw one, and this is definitely on my must-have list (after I get back from my upcoming vacation, that is; must save pennies to spend at Florida tea shops!). The good news is, consumers can order pieces directly from the company. For details, visit idalindseychina.com. 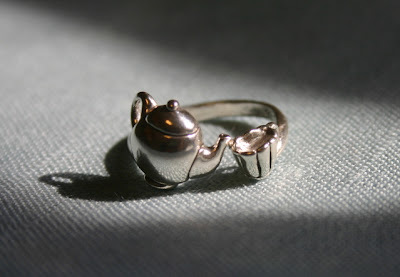 My tea jewelry wardrobe got a wonderful addition last week in the form of a new teapot and teacup ring from Dee Sharp of North Carolina. 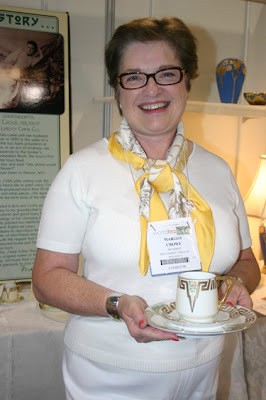 (And thank you, Denise, the fellow tea-lover in cyberspace who suggested I visit her booth at the World Tea Expo!) Dee has loads of lovely jewelry designs including lots of tea-themed ones, and my eye went straight to this ring and within about 60 seconds it was on my finger. 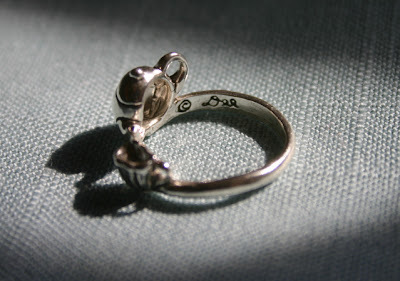 I have teapot or teacup earrings, bracelets, a necklace, Pandora beads ... but I'd never had a ring! Saw one in a catalog perhaps a decade ago, failed to order it, always regretted it ... you shoppers know how it is, the one that got away. Only when I got home and took off the ring did I noticed that her "signature" is stamped inside the ring. What a nice touch! You can also check out her website (deejewelry.com) and see designs such as her Shelley teacup and saucer jewelry. Among the new products I saw at the Tea Expo last week were these "CelebriTEA mugs" at the Tea House Times booth. 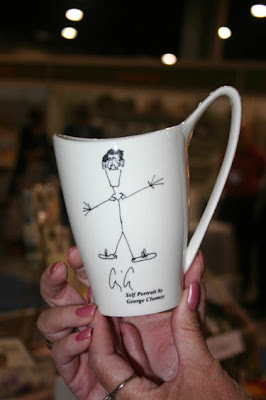 Celebrities including Nicole Kidman and George Clooney (whose mugs are pictured above), Samuel L. Jackson, Coldplay and David Bowie designed mugs to raise money for "charities tackling key global issues." 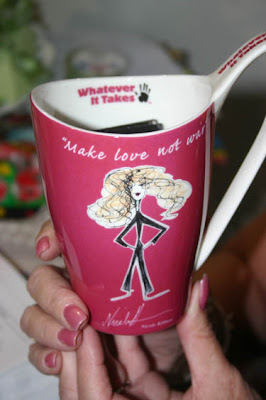 These mugs aren't personally my style, but maybe if the manufacturers add to the line they can get Rachel Ashwell of Shabby Chic fame to design one for those of us who enjoy more feminine teawares. Still, I think this is quite a lovely idea. And if these contemporary designs do happen to be your style, I did a search online and found prices for them ranging from $20-$25 each. 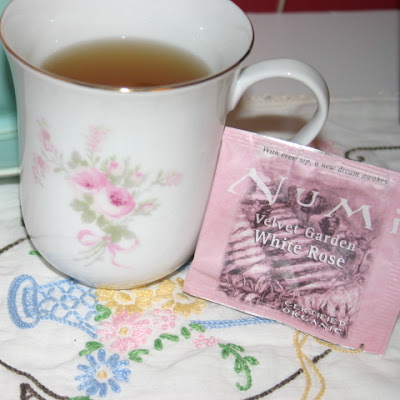 I do love the flavor of rose-infused teas, and there's a new one from Numi teas: Velvet Garden White Rose. 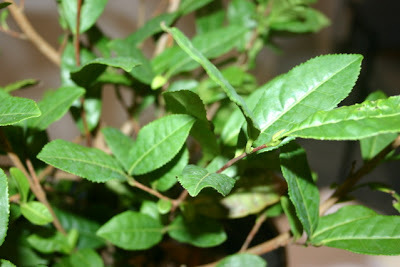 It has a very pronounced rose flavor, much more than some other rose-flavored teas I've tried, and I like it a lot. I was a bit cautious when trying this, because I received a gift set of Numi teas one time and liked only about half of them, but THIS I like. Very nice. Harney and Sons teas have had a place of honor in my tea cabinet for years. Their Peaches and Ginger black tea is my current Harney favorite, but over the years I've also enjoyed their Darjeeling, Florence (a chocolate hazelnut blend, yum! ), Cranberry Autumn and African Autumn (rooibos). 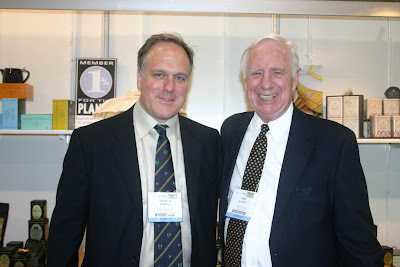 The Harneys have been featured in many magazine articles, especially over the last few years, and they're rather revered as this country's First Family of Tea, so I was tickled pink when I came across John Harney and son Michael at the World Tea Expo. I was like the proverbial kid in the candy store when I first entered the media suite and looked out over the Expo's show floor on Saturday morning. Tea vendors! At every booth! And plenty of them with things to sell! And sample! I noticed that quite a few vendors have the new blooming or artisan teas in their line, and the prettiest display of these I saw was from the Teaposy company. I actually have a Teaposy (blooming tea) to sample at home, but I'm thinking of waiting until I order one of their pretty glass teapots to steep it in. The individual size one with the sweet little handle (see these in the line-em-up photo) is just $18.99, which I think is quite a fair price. 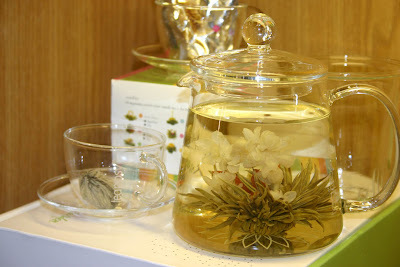 So that's my prediction of a trend in tea and teawares for the coming year: blooming teas and glass teawares! One of the many "tea celebrities" I met over the weekend was the truly lovely Alda Ellis, whose books and products I've enjoyed for years. 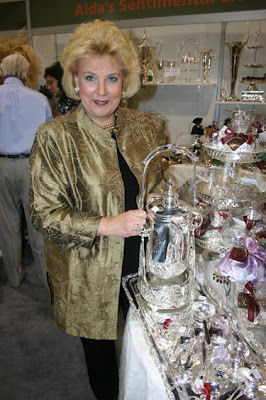 She has a line of beautiful gifts and many wonderful tea accessories (I want a silver Tipping Teapot before I die! ), and I can't see a gleaming silver Friendship Ball without thinking of her. Have you ever had one of those? I used to see them a lot at places like Collector's Corner in Sharpsburg. Usually someone gives you one of these silver balls as a gift (that's how I got mine), and then you are supposed to tuck some sort of tiny present inside and pass it on to another friend. Alda has also written numerous gift books, and after hearing her speak at World Tea Expo, I have ordered a copy of her "Sentimental Living" book and can't wait to enjoy it over a cup of tea. After her lecture, I had a chance to chat with her at her booth, and she was even more warm and gracious up close and personal. My spirit "clicked" with her immediately, and I couldn't help thinking that the beautiful silver pieces inside that booth weren't the only things that sparkled. So does Alda Ellis! Above are pictures of the jar of tea and my teacup with three teaspoons of the fruit mixture, to which I added boiling water and enjoyed a terrific cup of tea. 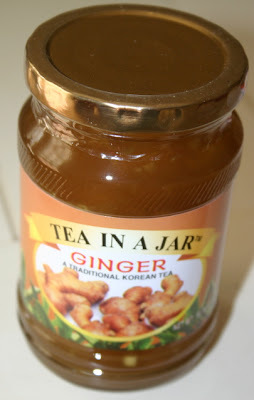 Yes, I know, this is really an herbal infusion and not technically a tea since it's not made with camellia sinensis, but hey, they named it "Tea in a Jar" and not "Herbal Infusion in a Jar." The new tea's website listed on the label (www.teainajar.com) doesn't appear to be working yet, but I suspect this is because the product is so new. I'll be checking back, because next I'd like to try the pomegranate flavor. Today was the final day of the World Tea Expo, and I spent the morning at sessions hosted by Dr. Ronald Sebold, who spoke on tea and health. Thank goodness this nice man had such exhaustive handouts, for I have tons of research studies I want to look up and check out for myself, but I will say this: I am going to up my daily consumption of green tea PRONTO. Sebold obviously has great passion for his topic, and I was more than a little amused when, after he told about studies on rats, he gave an example that began something like this: "Five rats go into a tearoom ..."
During a break I happened to run into a dear lady I met probably a dozen or so years ago, Mildred Huff Coleman, whose "Frances Virginia Tea Room Cookbook" is one of my favorites. I interviewed her when she came to Scott's Bookstore for a signing and was charmed by her Victorian attire and ladylike manner. I was delighted when she asked if we could sit together during the second session on tea and health, and I greatly enjoyed catching up with her. I'm sure I'll have more to say about her in print later, and hopefully we'll be adding my newspaper tea columns to this blog in the near future. 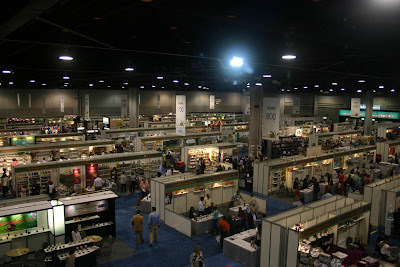 This is the first time Atlanta has hosted the Tea Expo, a trade show devoted entirely to tea, and I am thrilled to be among the press folks covering it. I have met some of the loveliest people, from speakers and tea purveyors to importers of teawares and more. One of the highlights of this day was meeting the wonderful Englishwoman Jane Pettigrew, whose books on tea are some of my favorites, especially her (now out-of-print, she says) "A Social History of Tea." She and co-author Bruce Richardson, pictured above, graciously signed a copy of their "Tea in the City: London" guide for me. There are so many great people, products and more to discuss, I know I'll have this tea blog busy for quite a while to come! Even BAD tea has a purpose, since you can save old teabags and use them to dye fabric and give it an aged look. The other day I needed a doily to place under a teapot to keep it from scratching a glasstop table. 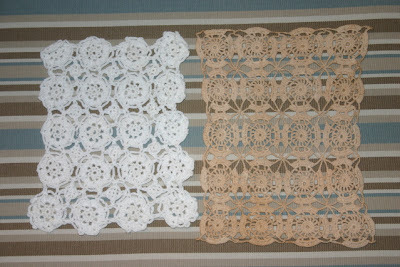 I have plenty of doilies thanks to my late grandmother, who I think crocheted most every day of her life, but most of them were white or ivory. I needed brown. Then I remembered the possibilities with tea dye! I put on a dozen or so past-their-prime teabags to boil. Once it reached a nice rolling boil I turned the heat off, then plopped in the doily to let it soak overnight. The next morning, I pulled out the doily and had a rich mocha shade. Perfect! If you've read today's Times-Herald and you're visiting one of our Times-Herald/Newnan-Coweta Magazine blogs for the first time, welcome. Nichole, Alex and I are all excited about this new opportunity to interact with readers through our individual blogs. I'm so pleased you're visiting this tea-themed blog, and I hope those of you with a specific interest in tea will click on "comments" at the end of a post if you have a question about tea or simply something to share. And I hope you enjoy these posts! Inspired by one of our magazine's writers who likes to venture into the local Mexican groceries, I took advantage of an afternoon tea break today and paid a visit to one of these businesses. 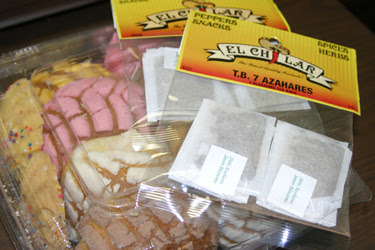 Yes, as I suspected, they had Mexican teas! The kind gentleman at the Greenville Street store showed me a display of herbs and spices which included some very reasonably priced ($1.49) bags of tea. I got the "Te De Limon" (Lemon Grass) and "Siete Azahares" (Seven Blossoms). The seven blossoms, by the way, include linden flowers, Valerian root, peppermint, chamomile, tumba vaquero (a Mexican medicinal plant), passion flowers and St. John's Wort. I also bought some of the light, cakelike pastries, which I promptly left for the office to share so I wouldn't be tempted to eat them all myself! Before I even took my first sewing class, I was already collecting patterns for quilts that feature teacup and teapot motifs. 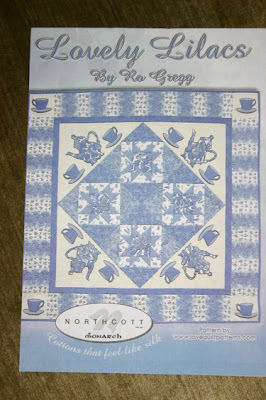 On Friday, I ordered one I saw in a new magazine and fell in love with immediately: Invitation for Tea from lovequiltpatterns.com. Would you believe I ordered this on Friday and it arrived - from California ! - today, on Monday? Now THAT's service! (And now my friends at the quilt shop will have to help me select the fabrics. I really love this particular blend of blues.) Won't this be pretty?